The Lincoln Presidential Half Marathon is held in Springfield, IL and winds through many historic locations. The course is mostly flat, but then has some hills around mile 9 and then levels out to flat again. We had perfect race weather, 50ish degrees, the sun was out and there was a light breeze. This was our first time running this race. 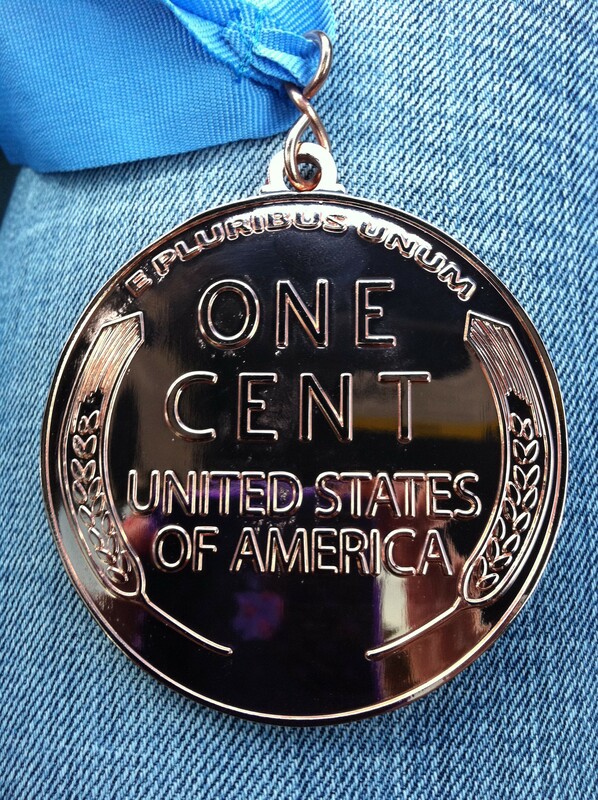 It was logistically easy to find and the finisher’s medals are giant pennys! When we got to the start line I found out that my Garmin was dead, not good! I had charged it and thrown it into my bag for Ride the Wave. It’s possible the button got bumped and the battery drained. I should have looked at it the night before. I won’t make that mistake again! It was very frustrating, I would have no clue if I was on pace at all. It was not going to help me set a PR. I felt great though so I hoped to just run by effort and see if I could PR with no data. Little did I know that my Garmin not working was foreshadowing the events that would unfold. We head out and our friend Rossi and I run together for the first few miles while he warms up. By mile 4 things take a turn. I get a terrible and familiar stomach cramp. Seriously?! My stomach has been cooperating lately and now this?! I am stubborn and refuse to entertain that I will need to make a potty stop and forego an opportunity at mile 6. I don’t feel like I can guarantee that stopping now that magic will happen. I tell myself, just 7 miles to go and then you can take care of business. By mile 8 I know my pace is slow and I have to go. I spot a porta-potty, but it’s by a water stop and this line of young girls is handing out water. They squeal because I’m a female and shout things like “go girl!” and many of them said “oh, I love your arm bands!” I couldn’t stop there! I didn’t want to say “thanks” and then run to the potty behind them. So I trek forward hoping that another stop will come soon or that my stomach would settle down. Up and down the hills, no potty in sight, through a cemetary….nothing. Now I’m in a very sickly and painful state. I am mad at myself for not taking the opportunity at mile 8 because I have no guarantee another chance will come. This race does not have potty stops at every water stop. After mile 10 I finally find a porta-potty and was there for what felt like 5 minutes, it was a long while. All I could think was that I’m lucky I don’t have my watch working so I have to witness how much time I’ve lost. When I finally get back on the course I feel dry, sick and puney. I tried to put on a brave face and smile for the cameras I saw on the course, but this picture shows how I was really feeling. My time still put me in 2nd place for my Age Group. I wasn’t feeling well and had to go home so I’m not sure if there was an award given out. 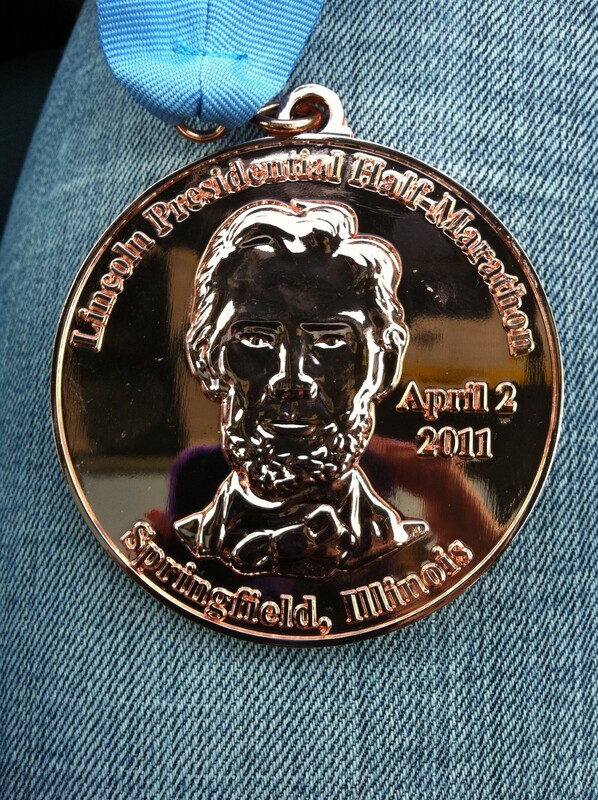 The sweet Lincoln Penny Finisher’s Medal. Afterward I was upset. I’m sick of having tummy troubles while racing. It doesn’t even feel like racing since my legs never get worked, only my stomach. I will be exploring new solutions to this issue and will let you know if I find anything that works. Something cool that happend before we left the race was that we were recognized by someone because of the blog! His name was Brian and he said “hey I know you guys” and introduced himself. It sounded like he had a great race and will also be at St. Louis. I’m so glad he said something. It was nice to meet someone who had liked my previous posts about Go! 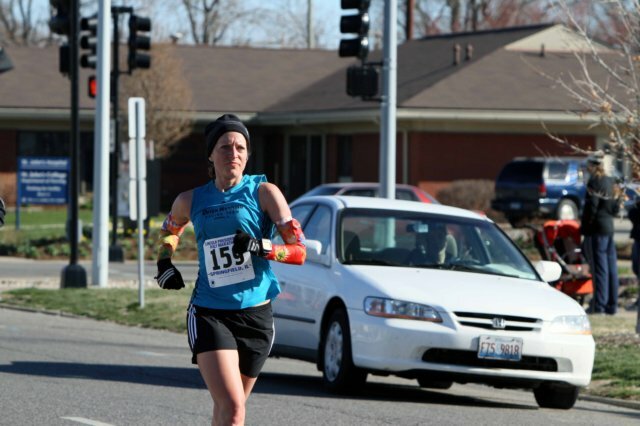 St. Louis Half Marathon. Brian, congrats on a great race and good luck in St. Louis! Well, I don’t know whether to say congrats, or I’m sorry. So, I’ll say both. Congrats on a great time, even if it’s not what you wanted. I’m sorry you had tummy trouble during your race. I felt pretty similar after my half. I could not get home to the couch soon enough. I don’t know if you’ve seen a Dr or not about your tummy issues? I think I’ve read that you are trying to maintain it by diet; but maybe the Dr can help you figure out what specifically you should avoid? Just a thought. I love that medal! It’s pretty awesome! Oh, and congrats to Rob on a rockin’ time! Thanks! I think I first need to start back with food journaling. I suspect I’m going to get the most out of a doctor visit if I have good notes about the foods, workouts and how I’m feeling documented. I’ve also started taking some extra fiber to see if that helps/harms the situation. Fingers crossed for this weekend, I will have a half marathon to see how more fiber makes me feel. That is such a bummer about your constant tummy issues! 😦 I have discovered in the past year that I have developed a lactose intolerance, so I have cut out dairy products completely and have never felt better! Good luck with sorting that out, it can be super frustrating! I was wondering the same thing. Could I be lactose intolerant or have a gluten issue? Not sure, so I’m going to start documenting my foods and see if that makes it easier to determine. I do know that sugar upsets my stomach, but I figured that was from eating less of it that when I do have it it’s upsetting. Ahh that must have been so frustrating. I can’t believe you made it through so courageously though!! It was very frustrating, but I guess it could have been worse, like not finding a bathroom! What an awesome finisher’s medal. I spotted the front on somebody else’s blog and was curious if the organizers went all out and did the back–or just took a shortcut. Thanks for taking the time to take a pic of the back too (and congrats to the organizers for going all out). Hope the stomach settles down on future race days! I was wondering the same thing and was plesantly surprised. It’s one of the nicer medals we have ever got. I would definitely do this race again. I think you should go see a doctor for your tummy! It can’t be nerves at this point, can it? Rob asked the same thing. He thinks I get too excited to race and cause my tummy issues to some degree. Not sure. Oh my goodness. Awesome job though for real with your race, even though your tummy hurt that is still a great time. Congrats on a super speedy time! Sorry that you’re having stomach issues, that must be endlessly frustrating….it’s like having an injury or something else that you can’t control, ugh. Love the medal, nice work, race organizer people.